Wolvekuil Kopjes, an action fought on 14 February 1901, during the guerrilla phase of the Second South African War, as a result of British attempts to capture the 1,400 - strong Boer commando led by General Christiaan de Wet into central Cape Colony from the south of the Orange Free State. On 12 February de Wet failed in an attempt to obtain supplies by raiding Philipstown, 68 kilometres north-west of Colesberg. He was subsequently pursued by a column of nearly 1,100 mounted troops - mainly Australians (from Queensland, Tasmania, Victoria and Western Australia) and New Zealanders - with eight guns and a pom-pom gun, formed into two corps with the whole commanded by Brigadier-General Herbert Plumer, which had been sent south from the Transvaal to help deal with the incursion. Plumer's force followed de Wet in torrential rain until able to force the Boers to fight a rearguard action at Wolvekuil Kopjes, 32 kilometres north of Philipstown, two days later. The British attack began at 8.45 a.m. with an advance by two squadrons of King's Dragoon Guards against a salient hill in the Boer's left centre. This movement was unsupported, and resulted in the party being surrounded and captured. The corps led by Lieut.-Colonel Cradock, composed almost entirely of Australians and New Zealanders, was next sent to attack the enemy right. After a ‘very dashing assault', during which 23 casualties were sustained, the Boer flank was turned and de Wet forced to abandon the position. Further rainstorms hindered the British effort to bring his flight to a standstill. Extracted from the book produced by Chris Coulthard-Clark, Where Australians Fought - The Encyclopaedia of Australia's Battles, Allen and Unwin, Sydney, 1998, pp. 88-89. L.S. Amery, (ed.) The Times History of the War in South Africa 1899-1902, Vol. 5 (1907), London: Sampson Low, Marston & Co.
Latest advices with reference to the invasion of Cape Colony by General Christian De Wet's forces, state that Generals Haasbroek and Woest, commanding a portion of the troops, crossed the Orange River alt Zand Drift, in the west of the Orange River Colony, on the 9th inst., and on attacking Philipstown were repulsed by the British garrison. Brisk fighting is also reported to have occurred on the 12th and 13th inst. at Petrusville, a village in the Philipstown division of Cape Colony. The enemy used a 15-pounder gun, which they had some time previously captured from the British, the shrapnel shell with which they bombarded the village bursting splendidly. Eventually Lieutenant-Colonel HCO Plumer, with a force of Australian Bushmen, arrived at Petrusville, and with a "pom-pom" gun, succeeded in extricating the little garrison from an awkward position. It is reported that 200 men of the Imperial and South African Horse were recently hard-pressed by General Haasbroek's commando, 20 miles to the west of Colesberg, a municipality situated 57 miles north of Middelburg. The British casualties during the engagement were light, and the Boer losses were much heavier. Lieutenant-Colonel HCO Plumer, with his Australian Bushmen, while pursuing the flying Boers to the westward, captured a Maxim gun and a great portion of General Christian De Wet's ammunition train. Intelligence has been received that all the males in Grasfontein, in the north of Cape Colony, have been arrested on a charge of having assisted the Boer invaders. The Boers, who recently retired from Calvinia, are reported to be splendidly mounted. On leaving Calvinia they travelled to Kenhardt, a village on the Hartebeest River, 120 miles from Prieska, covering 60 miles daily. It is reported that while a force of 100 Boers were engaged in fetching forage from Giringspoort, the Cape Cyclist Corps, who were entrenched on a neighbouring kopje, fired upon them and killed 17 of their number. 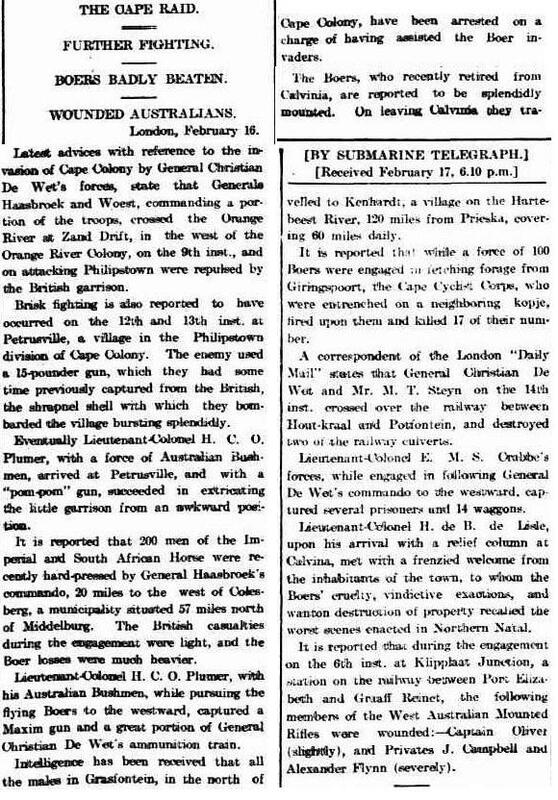 A correspondent of the London "Daily Mail" states that General Christian De Wet and Mr. MT Steyn on the 14th inst. crossed over the railway between Hout-kraal and Potfontein, and destroyed two of the railway culverts. Lieutenant-Colonel EMS Crabbe's forces, while engaged in following General De Wet's commando to the westward, captured several prisoners und 14 waggons. Lieutenant-Colonel H de B de lisle, upon his arrival with a relief column at Calvina, met with a frenzied welcome from the inhabitants of the town, to whom the Boers' cruelty, vindictive exactions, and wanton destruction of property recalled the worst scenes enacted in Northern Natal. It is reported that during the engagement on the 6th inst. at Klippkat Junction, a station on the railway between Port Elizabeth and Graaff Reinet, the following members of the West Australian Mounted Rifles were wounded:- Captain Olivet (slightly), and Privates J Campbell and Alexander Flynn (severely).